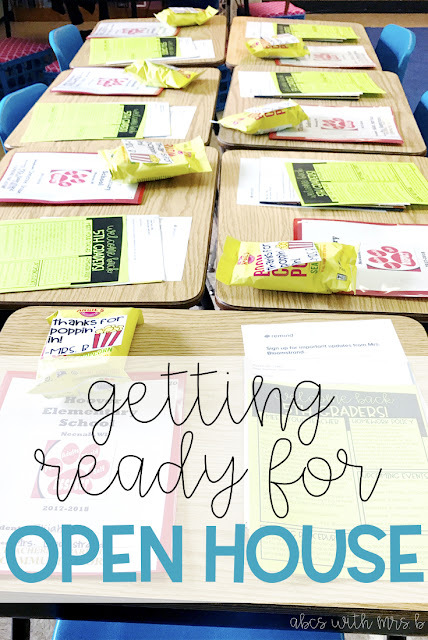 Getting ready for Open House can be a crazy and exciting time! Not only are we prepping to meet our students and their parents, but we are also setting up our classrooms and getting ready for the first day of school! 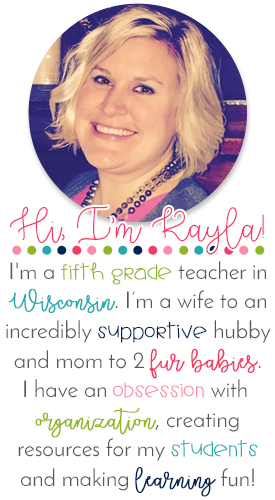 I really like to keep it simple for families to be able to pop in, drop things off and get excited for the school year! Here are a few things I get ready for my students and their parents on Open House night! 1. Folders: We have a school-wide take home folder, so I make sure those are available for my students right away. They always get papers and information at Open House, so this is a good place to store it all and get in the habit of using this folder for their children. 2. Scholastic Orders: I like being able to send home a few Scholastic orders for students at Open House and talk with parents about how easy and cheap it is to order, plus the added bonus of more classroom library books. Scholastic has a really great letter to send to parents with your class code already on it, so no need to recreate! 3. Moby Max: We use Moby Max often in my class and our school, so I also send a letter home to parents explaining the program. Again, Moby Max has a parent letter already available, so I print that off and send it home right away! 4. Newsletter: My newsletter before school starts is really simple. I include information about me, plus my contact information. I write about our homework policy to make sure students and parents are aware right away. I also give any upcoming important dates for the month of September so parents can put it in their calendar right away. This year, we changed our arrival procedure in my building, so I made sure to include that information as well. I made editable newsletter templates that you can find HERE to help you get started! These newsletters are easily adaptable for the entire school year. 5. 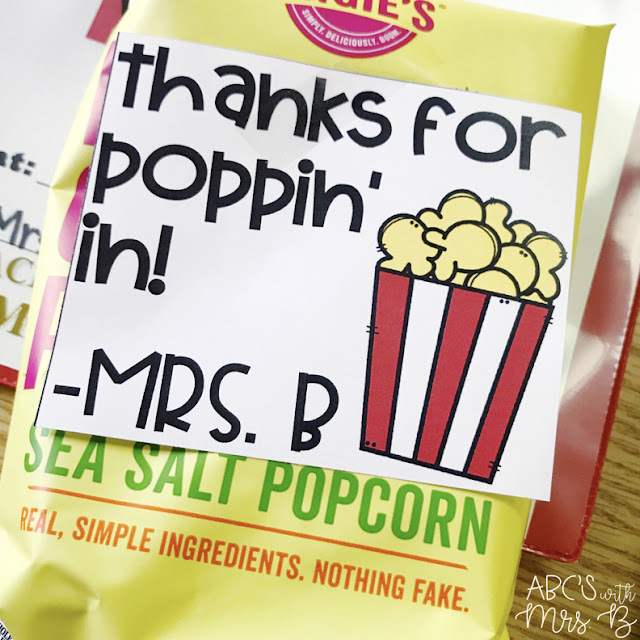 Snack: I like to give a little snack to give the students something more exciting to leave with - the papers are generally more for the parents. Last year, I bought Starburst for the kids with a super cute tag you can grab HERE from The Applicious Teacher. This year, I decided to go a little healthier and grabbed bags of popcorn off Amazon for the kiddos. I created a tag you can grab for FREE HERE. That's it! Super simple, super easy and super quick! How do you get ready for Open House? 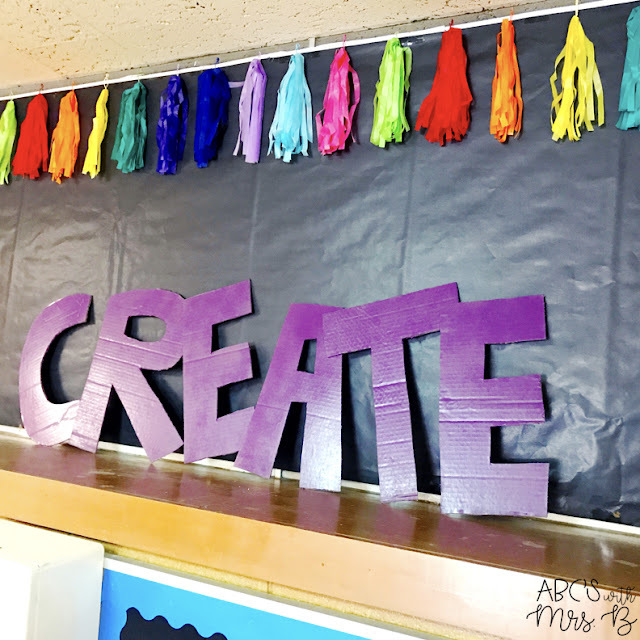 I have this awkward space in my classroom (not a bulletin board) that looked too bare, so last year I decided to cut out all these letters and make inspirational words for my students to reference all year...they fell down after two months...fail. This space didn't get any better and looking at it for the rest of the year was an eye sore, so I took the summer to rethink the space. I found some great ideas using big letters from Hobby Lobby or Amazon, but I did NOT want to drop over $100 for this to work, so I had to get creative. Here is what I came up with! The first thing I had to do was collect cardboard boxes. Luckily, my husband was able to get me a ton quickly from his job so I was able to get started right away. I cut the pieces to similar sizes to get them ready for tracing. 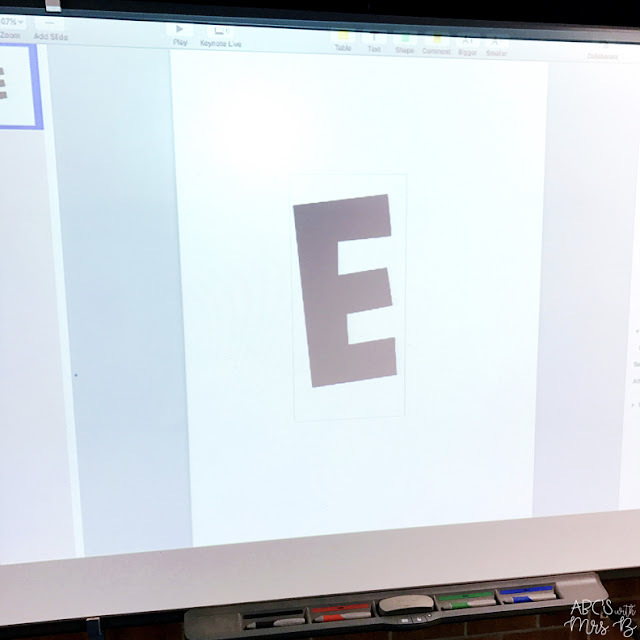 Then I opened a new file in Keynote (you can use Word, PP, Google) and typed in a letter in a text box with the font that I wanted. I projected it onto the screen of my SmartBoard. 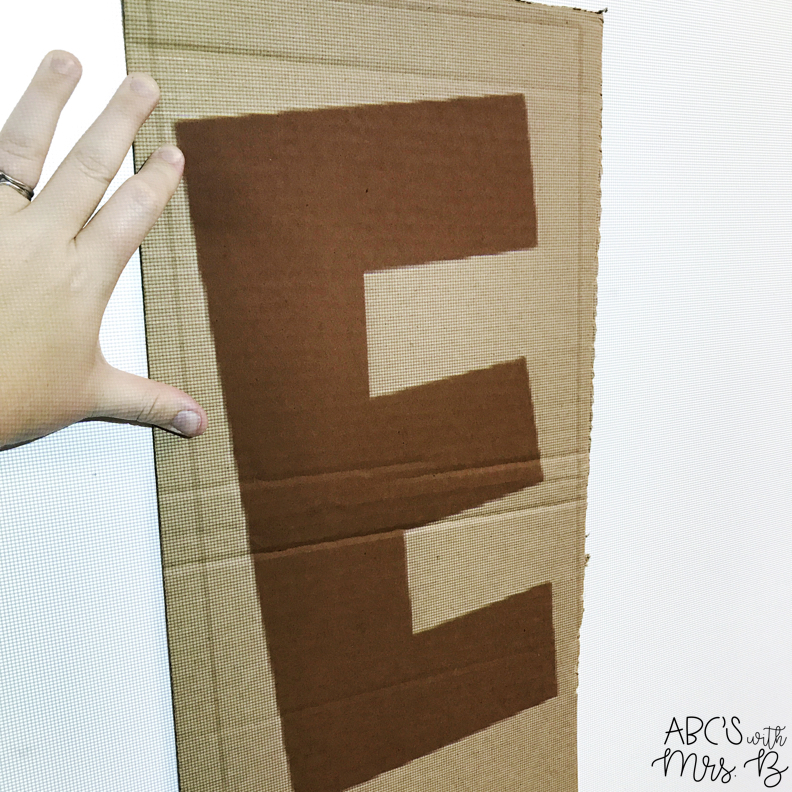 Once I had the sizing right, I held up a cardboard piece on my SmartBoard with the letter projecting onto it. I traced the letter on the cardboard piece with a pencil. 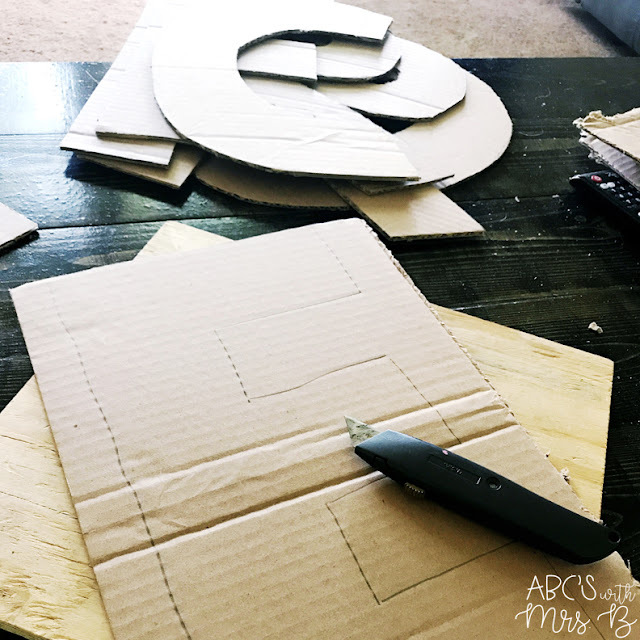 After tracing all the letters, I cut them all out using a box cutter. The edges frayed a bit, but because of where the letters were in my classroom, I wasn't concerned about seeing the frays. 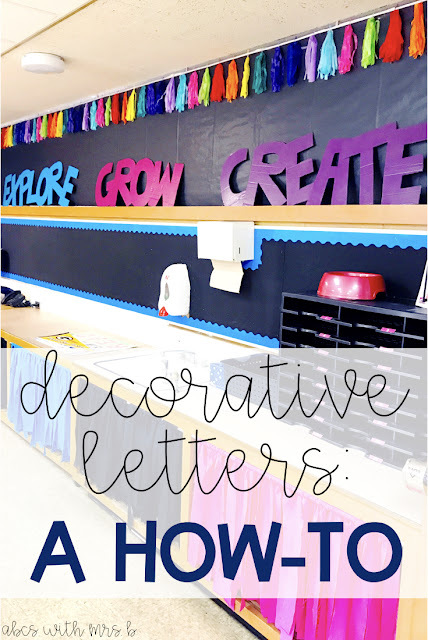 Once all the letters were cut out, I grabbed some cans of cheap spray paint from Walmart of my classroom colors and sprayed the letters outside. This took maybe 5 minutes. I sprayed on two coats. When the letters dried, I hot glued the edges of the letters together to make one big word. Now the words are sitting on top of the shelf against the paper. They look great and I know they won't fall! They are set for the year (and hopefully years to come)! Win.